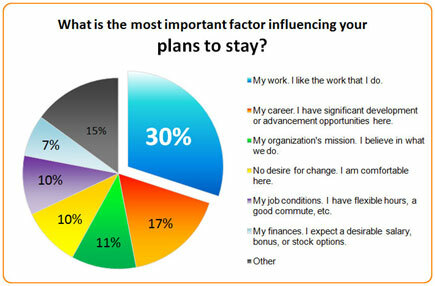 What Makes Us Stay (In Our Jobs)? Home → Tru Leadership → What Makes Us Stay (In Our Jobs)? Reportedly, a person’s direct manager is the #1 reason people leave companies. However, in a recent study it was revealed the manager is actually number 7, out of 8 key reasons for why people stay with companies. The top reasons Americans give for not leaving their current job are “I enjoy the work I do” and it “fits well with the other areas of my life.” That’s according to a new survey commissioned by the American Psychological Association, which contains a number of revealing insights into employee motivation. It seems interesting that one way to keep your best people from jumping overboard is to make them feel more connected to the ship. Compensation is obviously important, but not as much as economists would tell you. Few people will tell pollsters that they wouldn’t want more money, yet apparently we seem to want job satisfaction and meaning more. The above survey also matches closely to a Blessing White survey from 2011, that the work we do matters greatly to our motivation in staying with an organization. Get connected. If not here, then somewhere that matters to you.